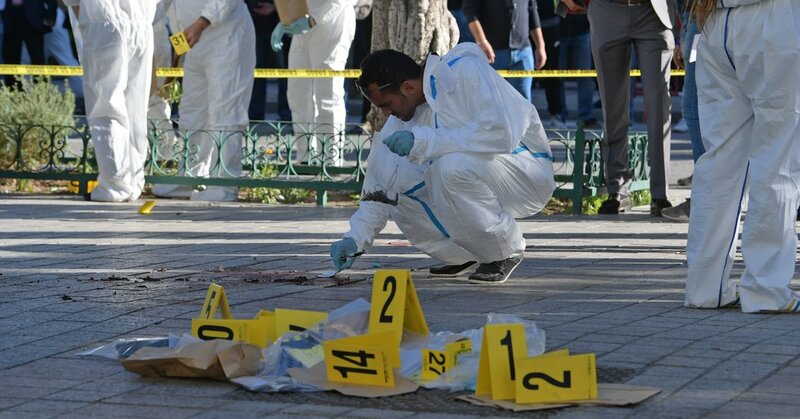 TUNIS, Tunisia – A suicide bomber injured nine people, mostly policemen, on a busy tree-lined street in the Tunisian capital on Monday afternoon, the authorities said. The Interior Ministry said in a statement that The suicide bomber, who was previously unknown to the authorities, blew near a police patrol. It said eight police officers and one civilian were injured. There were no more deaths besides the bomber. Zaag was quoted by TAP as saying that the explosion had taken place in front of the Municipal Theater of Tunis. The Habib-Bourguiba Avenue is considered the cultural, political and economic heart of Tunis – and is sometimes called Tunisia's Champs Elysees. Tunisian radio station Mosaique FM said the attacker carried a self-made bomb belt with a small amount of explosives. The station cited a security source that she had not named. She said the bomber was from the Mahdia region of eastern Tunisia and was previously unknown to the security services who searched her home after the attack. The Tunisian authorities were on fire After a flood of attacks, including a deadly shoot-out at the 2015 Bardo National Museum in Tunis, which killed 22 people, many of them European tourists, it was on high alert. Three months later, an Islamic extremist attack in the seaside resort of Sousse killed 38 people, mostly British tourists. In November of the same year, a suicide bomber blew himself up in a bus carrying members of the Tunisian Presidential Guard, killing 12 people on a main Tunis road. The group of the Islamic State later took responsibility. reported Thomas Adamson from Paris. John Leicester contributed to Paris.